NJ Burkett has the latest. 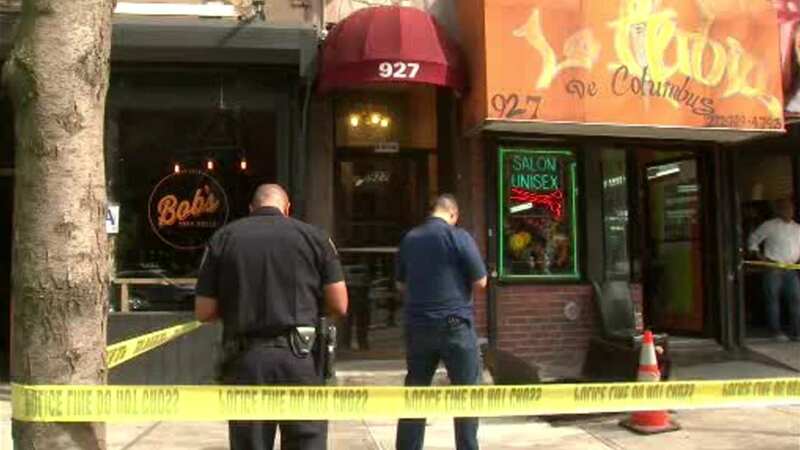 UPPER WEST SIDE, Manhattan (WABC) -- At least two shots were fired into a barbershop in Manhattan on Tuesday afternoon, and the target appears to have been a 12-year-old boy. It happened around 1:30 p.m., while customers sat inside the shop between 105th and 106th streets on Columbus Avenue on the Upper West Side. Police say a young man with a .32-caliber gun apparently ran up to the barbershop and opened fire. The owner, another barber and two customers were inside at the time. "There were two young men in the store, one was getting a haircut another young man entered and fired two shots," the owner said in Spanish. "I don't know what happened, after when I saw the gun, I threw myself on the floor." Watch unedited video showing man pull out a gun and fire shots into a barbershop in Manhattan. Police say that one of the customers waiting in a chair along the wall, a 12-year-old boy, was the likely target of the gunman. Amazingly, nobody was hit or injured. Authorities believe the incident to be gang related. From what detectives have been able to determine so far, the suspect asked the 12-year-old "Are you from Douglass," apparently referring to the nearby Frederick Douglass Houses, a city-run apartment complex reportedly known for gang activity, prior to the shooting. The boy answered yes, which appears to be the motivation for the shooting.